A Vietnamese man has chosen to follow the newest agricultural trend which guarantees both profit and quality, with human health always in his mind. While most villagers in Son La Province, located in northwestern Vietnam, still rely heavily on pesticides when growing vegetables and fruits, 30-year-old Vu Xuan Thanh pioneers clean agriculture practices with his organic crops. The Na San region, near Son La’s airport, is where Thanh’s orange garden is located. Customers are often invited to visit, observe, and acquaint themselves with clean agricultural practices that are becoming Thanh’s values to guarantee safety and quality of the goods he sells. Thanh’s garden of one hectare is covered with orange trees with ripe fruits hanging off of the branches that look like orange polka dots on a green background from afar. All these oranges are waiting to be reaped and sold in Hanoi’s organic grocery store chain ahead of Tet, when many kinds of fruit are in high demand. Tet is the Vietnamese way to refer to the Lunar New Year festival, which is less than two weeks away. “Actually I am not satisfied with the quality yet, but looking back at what I have achieved makes me very happy,” the owner of the garden said, indicating that the goal he set for himself is much more ambitious. Each of the trees averagely bears 30 to 40 kilograms of clean oranges. “My goal is to practice clean agriculture where I do not use any pesticides or growth-stimulating substances,” Thanh said. In order to boost growth of the fruits, he uses organic fertilizers made of natural components including grass. Thanh decided to follow the current career path six years ago when he went to Hung Yen Province in the Red River Delta in northern Vietnam to sell longans. During his visit, he had a chance to learn more about sweet oranges grown organically, which are highly profitable because customers are willing to pay higher prices. Coming back home, Thanh started cutting down coffea shrubs he was growing and replaced them with sweet orange trees. After four years of waiting, the farmer was both confused and impatient as the trees produced no fruits. “Four years with no fruits,” Thanh said. “I was growing impatient and many times thought about cutting down the trees. Later he learnt that newly-grown trees do not produce many quality fruits. The older the trees become, the more quality fruits they produce. 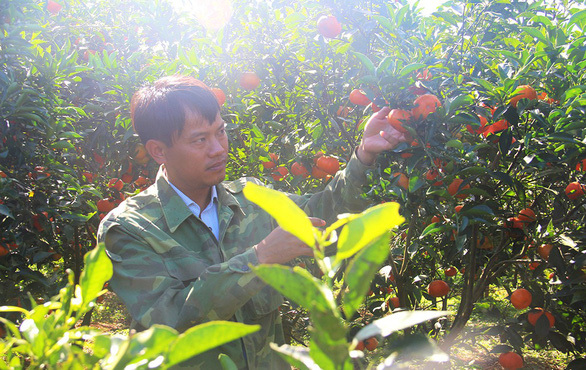 In 2017, his sweet orange garden started producing the first batch of oranges even though Thanh was only able to collect just around 10 tonnes of the fruit. Back then, merchants would come to buy fruits from farmers at unstable prices, changing every year, to sell at the wholesale agricultural market of the region. Not only Thanh but also his neighbours were fully dependent on the prices the merchants offered and their dealings. Vexed by the unfairness of this situation, he pondered over how to guarantee himself and his peers more financial stability. Hence, he began researching and planning the development of his sweet orange garden to maximize its profit and credibility. The farmer even traveled to well-known orange-growing regions where he got to know many passionate farmers that gave him detailed instructions and explanations. Living in Son La, he had to adjust the practices he learnt to his region’s climate to be able to grow the fruit effectively. Being confident in his way of practicing clean agriculture, Thanh established a co-op of his region named Na San Agricultural Co-op with eight members, most of whom are still young and open-minded. The members are all taught techniques and steps to attain high efficiency while following the correct procedures of clean agriculture. The 30-year-old farmer is also responsible for developing the brand, finding distributors and a stable market. Nowadays, the co-op Thanh developed has gotten a stamp certifying its fruits’ credible origin and the products are sold at organic grocery store chains in Hanoi. “Many farmers still have a habit of abusing chemicals and fertilizers, which results in fruits unresponsive to these chemicals and diseases in people,” Thanh said. “I hope that everyone would change their agricultural practice instead of depending on pesticides and growth substances that only provide low-quality products,” he added, indicating that customers nowadays are willing to pay higher prices in exchange for quality and health benefits. “I had never thought about practicing clean agriculture that is safe for health, but now the market has changed so we need to adapt,” one of the co-op members said. Na San Agricultural Co-op has also been making efforts to spread the awareness by allowing kindergarteners and elementary school students to visit its gardens to learn about clean agriculture and how it is being adopted. “I want to provide the students with an understanding of organic agriculture,” the founder of the co-op said.